Spice up your bedroom with a fun quote showing how you feel about your spouse! This "P.S. 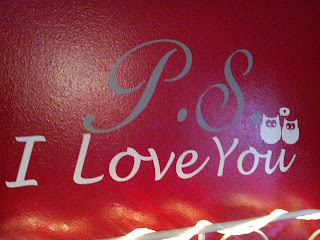 I Love You" can be display as shown, or you can overlay "I Love You" on top of the "P.S." The two owls to the side are an added touch of whimsy. Various colors are available to match your decor, as well!